Peak Rock Farm is a 50 acre farm located 1 hour south of Boston, 45 minutes south east of Providence, Rhode Island and just minutes from the ocean. Owned by Kathy Von Ertfelda, Peak Rock Farm is a 19 stall dressage facility with ample double fenced turnout paddocks, an Olympic size outdoor arena with 70 ft. of mirrors, a full size grass arena, a 60 ft. x 120 ft. indoor, a jump field, hayfields for galloping, and a beach located 5 minutes away for riding and horse swimming. 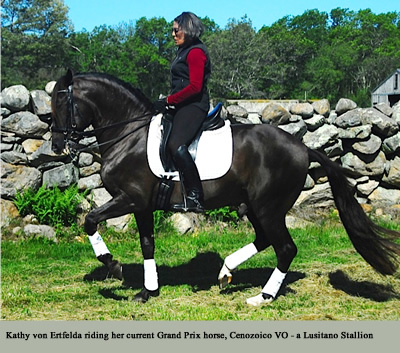 The services at Peak Rock Farm include classical dressage training for horse and rider at all levels, including Grand Prix, short or long term. Peak Rock Farm does not have "school horses" for lessons. Peak Rock Farm specializes in training Lusitano horses. Peak Rock Farm occasionally has top quality dressage horses for sale. Please contact us for availability. Peak Rock Farm occasionally has openings for ambitious working students who are eager to learn and work in an environment that stresses the importance of good basics and classical riding.